of the worst days in our 97-year history . . . "
We are smack dab in the land of doom and gloom. Arizona and California have more serious budget problems (about double the deficits) than any other states in the country right now. Every state except Montana and North Dakota has to make some tough fiscal decisions ASAP to stay afloat, even as the federal government gets us deeper and deeper into debt -- and reallocates more and more of its debt to the states. States can't print money, borrow from China, or run trillion-dollar deficits like Congress can. So guess what happens? Jim and I have done our best to stimulate Arizona's economy while we've been here the past ten days but I'm afraid we've been mostly unsuccessful because it's not in our best interest to go into debt. Yeah, we've grudgingly paid the 25% increase in campground fees at McDowell Mountain Regional Park -- but we're going to cut our visit short by at least a week because of it. How many people or families do you know whose income has increased by 25% this year?? Our pensions, savings, and investments certainly haven't gone up that much. Increasing fees on recreational pursuits, however, makes more sense than reducing critical public safety budgets like police and fire services; that's under serious consideration in Phoenix and Tucson. And once again, we've shopped for a new 5th wheel camper -- but the local dealers aren't as eager for a sale as we were hoping and state laws make the transaction so insane for out-of-state buyers that we won't ever be buying an RV in Arizona. More about that in a minute. Meanwhile, the state of Arizona is almost bankrupt and devising ways to squeeze even more money out of its residents and the sunbirds who migrate here during the winter. I don't know how it's going to survive an approximate 40% budget deficit without drastically cutting services and jobs, becoming a lot more efficient, and/or privatizing some departments. Cities and towns within the state are also in dire straits, according to local news reports. Arizona has one of the highest rates of unemployment and home foreclosures in the country. How do local and state officials expect to get more money out of residents through various tax increases when so many folks are already struggling with their own finances, desperately trying to avoid personal bankruptcy? The state isn't making things attractive for tourists to come spend their money here, either, with already-high sales taxes, rest area closures, park fee increases, and plans to shut down the state parks (no word on when that will happen). 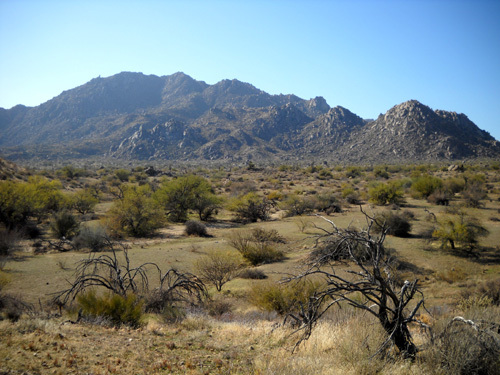 We started visiting the Phoenix area in February, 2004 because of its warmer climate and to run the Pemberton Trail 50K at McDowell Mountain Park. We came back in the winters of 2007-8 and 2008-9 for a few weeks before and after the Across the Years (ATY) 72-, 48-, and 24-Hour runs. We really enjoyed all those visits. This winter we're more ambivalent. With higher prices and ATY on hiatus (maybe never coming back), we don't have as much incentive to return to Arizona next year. It costs a lot to get here from Virginia and it is becoming more and more expensive to spend any time here. That's one reason we haven't been to California since 2004. Phoenix is not the paradise you may think, even in the winter. Yes, 65° F. sunshine in December is ideal, but the usually-pleasant desert climate can also turn harsh, as yesterday's deadly storm illustrates. As mentioned above, state and local budgets are in free-fall and everything seems more expensive to us here than other places we travel. Traffic is a mess at rush hour, even with fewer people working. The area teems with illegals. Crime is rampant. The desert grass is greener one day after a good rain; this view is toward McDowell Mountain. A few days ago a local 57-year-old woman was killed at close range with one bullet by an unknown assailant while she was running in her nice residential neighborhood; that story got our attention more than any of the other local murders we've heard about in the last ten days. Her friends and relatives say she had no enemies, which leads investigators to suspect a random shooting. No suspects have been arrested. You can imagine the fear folks now have in that neighborhood. I feel pretty safe to run and hike alone with Cody at McDowell Mountain Park. I always try to stay aware of the people around me on trails. Although I'm not paranoid after this woman's murder in town, I'm definitely a little more aware of the people around me out here in the desert. It's a shame that anyone, male or female, should have to be cautious everywhere they go, but that's life in the 21st Century. Yes, I know crimes like this are not confined just to the Phoenix area -- but it does have one of the highest crime rates in the country. I guess the excitement of vacationing in the Phoenix area has lost a little of its luster for us. 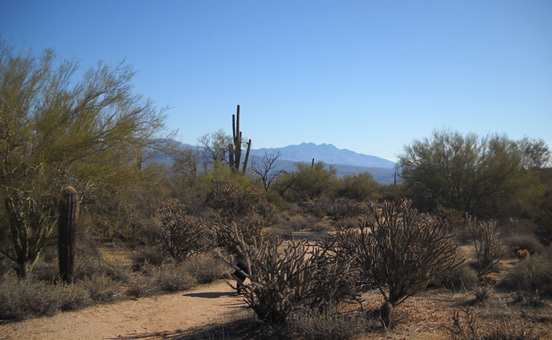 We sure do enjoy camping and exploring the trails at McDowell Mountain Park, though. 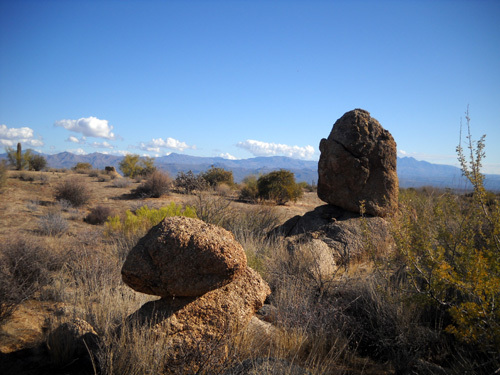 Despite the downsides, we'll probably continue to come back because of the lure of the Sonoran Desert (and ATY, if it resumes). 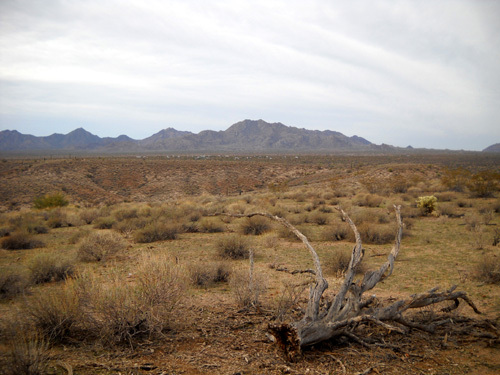 We need to explore some other attractive places in southern Arizona that may be less expensive than the metro Phoenix area. We plan to visit one of them in a few days . . . I've mentioned in this journal previously that we've been considering buying a new RV for the past couple of years. We've gotten a lot of use out of our HitchHiker II 5th wheel camper, which we bought in the summer of 2003, and it's showing its age. Luckily, Jim can repair most everything that needs fixing but the uncertainty of "what's going to go wrong next" is really wearing him down. Blowouts on remote or busy freeways, sheared pins in the slide-outs at the most inopportune times -- these are the kinds of unexpected problems that have given us more gray hairs. We're also afraid that something expensive, like the refrigerator or HVAC unit, will self-destruct soon. We learned a tough lesson by hanging on to the old F-250 too long, finally replacing it right after the transmission blew. We don't want something like that to happen with the camper. So we figured we'd look at new 5th wheels again while we're in an area with several large RV dealers. Fifth-wheels are the most practical type of RV for us. That's why we replaced the F-250 with another diesel pick-up truck in February instead of getting a Class A or Class C motor home. Fifth wheels are easier to maneuver than travel trailers (5th wheels hitch inside the bed of the truck; trailers hitch to the bumper). We think they offer the most living and storage "bang for the buck." Our 32-foot 5th wheel, which is really 34 feet long, with three slide-outs has more storage and living space inside than any of the dozens of big motor homes that we've been inside. You can see our largest slide-out in the photo above (pantry and dining area). The bedroom and living room slides are shown in the next photo. Some 5th wheels have more and/or bigger slides now. Finally, the cost of 5th wheels is light years less than a motor home, since they aren't self-propelled. Even our truck + 5th wheel combo is much less than any Class A motor home (the ones that look like a bus) and many Class C's (their front ends look more like a truck). We thought our timing was perfect to purchase a new RV. It's late December, when most people are preoccupied with the holidays and/or digging out from all the snow they've gotten and are not thinking about a new camper. 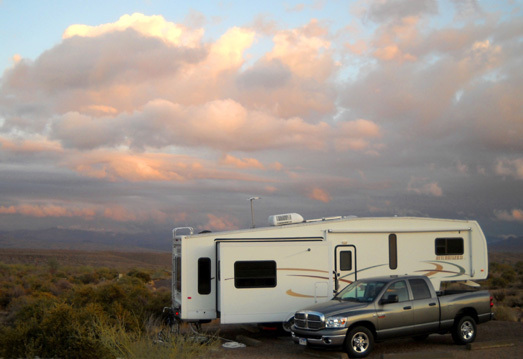 Springtime is traditionally the busiest season for RV sales. We also thought dealers would want to clear as many units off their lots by the end of the year as possible and hoped they'd be hungry for a sale right about now. The entire RV industry has been in shambles for the last couple of years. Some RV manufacturers who have been in business for decades have declared bankruptcy and/or gone out of business completely. Look at what happened in Elkhart, Indiana, where a large chunk of the local economy was dependent on the production of new RVs; that city is really suffering. Other manufacturers who were able to remain in business seriously cut back on production. NuWa, for example, the company that made our HitchHiker, stopped production for a while and wisely kept only their warranty, maintenance, and parts divisions open. Now, with the approach of spring and a faint light at the end of the economic tunnel, NuWa is producing some new units again. When car manufacturers and big banks were bailed out earlier this year by the federal government, RV manufacturers did not reap the same benefits. All this had a trickle-down effect, of course, putting the hurt on peripheral businesses like RV parts suppliers. Most RV dealers around the country have also been adversely affected. Many have closed because so few people are buying campers. A local example is the large Beaudry RV franchise in Phoenix and Tucson; we heard on the news recently that they are letting employees go and may close one or more of their dealerships. The economic recovery hasn't come quickly enough for them. With fewer RV units being produced and offered for sale, the selection has dwindled. There are fewer campers available when someone like us does want to buy one. That makes for a more difficult search if you're as picky as we are. After all, we will be living in the new unit most or all of the time. It's not just for occasional weekend trips. MORE THAN "NEW PAINT FEVER"
We pretty much know what we want: a durable, high-quality 5th wheel camper similar in size to what we have, or smaller, with a floor plan that works well for us. We are more interested in quality than quantity. We have enough problems already at some public parks getting our medium-sized rig into tight spaces; we don't want to get a longer unit. We know that a camper with two or three slide-outs and a true length of 30-34 feet is large enough inside that we won't kill each other (!). In addition, a well-built RV that size will help the truck get better fuel mileage than a longer, heavier model, saving us money both at purchase AND in the long haul (so to speak). 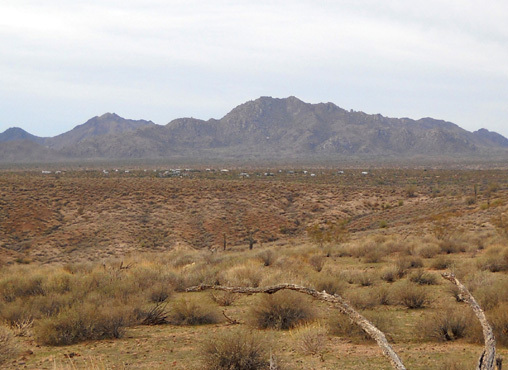 Folks on the south loop of our campground have a great view of the Goldfield and Superstition Mountains. We haven't zeroed in on specifically what brand or model we want. There are several that meet our needs, if we can just find one closer than northern Washington state (long story). We know that Keystone's Montana series, Heartland's Bighorn models, and NuWa's HitchHikers have the features and quality we want in the shorter models. We still need to do more research to find the right unit at the right price -- and in the right state. It's been fun to traipse through various models and see how much they have improved in six or seven model years. We have "new paint fever," as my brother would call it, but we're not in a hurry to get a new RV. We are looking forward to eventually having hydraulic slide-outs, a double refrigerator and freezer, more counter space, and our very first flat-screen TV. It's ironic: most of these models have two TVs, more than we have at our house! We don't even have a flat-screen TV in our house or current camper. Our old TVs work fine with digital converter boxes, so why buy new ones until they self-destruct? 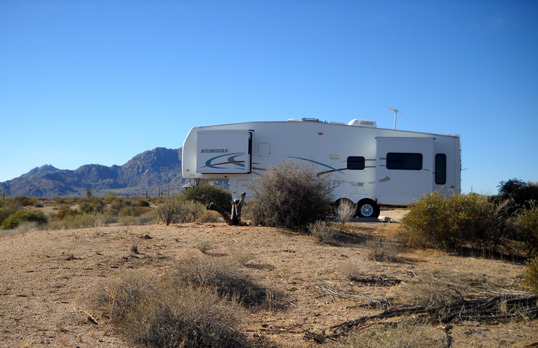 We negotiated prices with two RV dealers in the Phoenix area but they aren't as "hungry" as we expected, even knowing we were serious buyers and comparing their prices with other dealers. We over-estimated their desperation. From all we've read we expected them to be more willing to slash prices at the end of another terrible year in the RV industry. Maybe they expected us to haggle further, but we made it clear from the beginning that we wanted their best price the first time around or we'd walk away. We aren't going to play that game. Our experience with these RV dealers was very different than when we shopped for our truck last February. There were so many incentives to buy cars and trucks at that time that we got spoiled, I guess: huge discounts, an extra $1,000 off if we got a 4-year, zero-percent loan (that was a no-brainer, even though we planned to pay cash!) . . . Apparently the RV industry is a whole different ball game, even in a bad recession. Another deal-breaker arose early in the process: we completely forgot about Arizona's screwball tax laws regarding the purchase of vehicles by out-of-state buyers. We've read about it previously on RV internet forums. In all states but Arizona (I think), if you buy a vehicle in a state other than your state of legal residence, you pay whatever your home state charges for vehicle tax -- not what the state where you're buying it charges its own residents. We had no problem at all with this when we got our truck in Texas. We paid the new vehicle tax charged by our state of legal residence, which was lower than that of Texas. But not Arizona! No, they've got weird laws that really complicate things. For details, do an internet search. Long story short, in Arizona out-of-state buyers with proper proof of residency pay their own state's tax on new vehicles but they 1) are either liable for local Arizona municipal taxes up to 5% on the purchase or 2) can pay a hefty surcharge to take delivery of their new vehicle across the border in California, Nevada, or New Mexico. 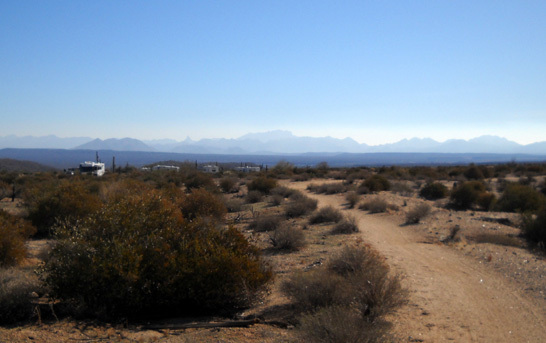 With the second option, the RV is literally hauled by the dealer or a contractor to Blythe, CA, Lordsburg, NM, or Big Water, UT and the buyer takes possession there. Even if we found the right camper at the right negotiated price in Arizona, the hassle of actually picking it up across one of the state lines -- or paying what amounts to ransom to take possession at the dealership in Arizona -- is a deal-breaker for us and probably a lot of other out-of-state costumers. So phooey on buying a new RV in Arizona! We're done trying to stimulate your economy (except for necessities and the little purchase described in the next section). Maybe we'll find the perfect camper for us in Texas next month. If we don't get a new camper on this trip, we'll probably make some cosmetic repairs and improvements like new flooring to the HitchHiker in the spring so we can continue to enjoy it another year or two and make it more attractive to the next owner. Jim and I rarely exchange major presents on special occasions; we're so casual about gift-giving with each other that we often designate a larger-than-normal personal purchase during the weeks preceding Christmas or our birthdays as "my present" for that occasion, even if we'd be buying it anyway. For example, when we were looking at new campers recently, we joked that would "cover" our Christmas and birthday presents for the next decade! As you know, that purchase didn't happen. To my delight, yesterday Jim got himself a "Christmas present" -- the first ham radio he's had for almost thirty years! I've been encouraging him to get one for months. His timing was based on a race in January where he might use it, however, rather than Christmas in two days. Jim was only fifteen when he first became interested in ham radios. While still a teenager he earned the first two levels of licensure to operate them. After he got out of the Army he earned the highest level ("extra") and has maintained that license ever since. His call sign is KI9M (Kilo-India-Nine-Mexico). When Jim was in his early twenties he built his own ham radio. He kept it until he was so busy with running and working two and three jobs to support his family in his thirties that he simply didn't have time to enjoy that hobby, too. He donated his radio to a local ham group and asked that it be given to someone who couldn't afford to buy a radio. Although he's retained his memory of the Morse Code and other operational skills, he hasn't had his own ham radio since then. His interest in the hobby was reawakened in 2006 when he started talking more to the hams at the Hardrock Hundred (HRH) in Silverton, Colorado. We really enjoyed working with Jim and Carol Lewin at the Cunningham aid station the two years Jim captained that station. 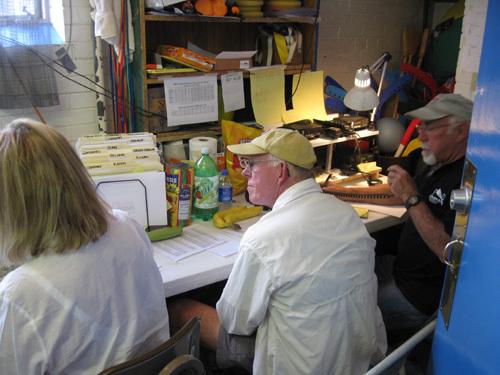 This past summer Jim helped collate runner data with another couple, Roy and Laura, shown below, at HRH race headquarters. At the Leadville 100 bike and foot races he took a more active communications role at headquarters and two of the aid stations. Although Jim gained experience with each race, he was at a disadvantage because he didn't have his own radio. He had to borrow them from other hams at Leadville and that didn't work out so well. Anticipating further ham communications volunteer work in the coming year, Jim has been researching the various types of radios that are suitable for the remote and/or mountainous races we like to run and work. He has had trouble justifying buying a radio for that sole purpose but I've been encouraging him to get one so he has an engrossing activity besides running and the computer to keep him busy when we're traveling. It's a worthwhile, relatively inexpensive hobby that we can afford. Jim's also had some difficulty figuring out whether to buy 1) a handheld radio with less power that uses repeater signals on mountains, or 2) a more powerful mobile radio that runs off a big 12-volt battery, like the one in our truck. Hams at ultras and other events use both, depending on their location: a remote, hike-in aid station versus one to which they can drive. Since the models he was considering aren't that expensive, I suggested he get both. To keep him even busier, I asked whether he'd be interested in building another radio but he said that's no longer as easy as it was 35 years ago. Today we drove across Phoenix to the Ham Radio Outlet, Inc. so Jim could look at some models he found at great prices on the chain's website. 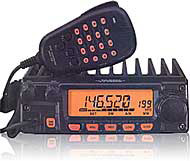 He ended up buying a radio on close-out for only $109 that should meet his needs for a while, a Yaesu FT-2800M. It's shown below. (Of course, he had to play with models that ranged up to $5,000 that were displayed in the store! It's only human nature.) He also got a good dual-band antenna to enhance reception. When we got back to the campground Jim read all about his new toy but was frustrated that he couldn't operate it in the camper, only the truck. The radio requires a 12-volt battery connection. As he sat at his laptop, alternately surfing the internet, reading his new radio manual, and watching TV (who says men can't multi-task? ), I could see the wheels spinning in his head: he was figuring out ways to run wires inside the camper to connect with a 12-volt outlet. Today he bought the necessary connections to accomplish the task. It didn't take long. He even put the antenna on the camper roof! Now he can use his radio in the camper as much as he wants. He's going to "lurk" for a while before starting any conversations with local hams, though. He wants it more for races than everyday use. Listening in on some of the dialog local hams (all men so far) are having, we both wonder why they don't just pick up their cell phones and keep these personal conversations private! I'm happy that Jim got a ham radio -- that'll keep him out of my hair. (Just kidding!) I like helping with communications at some races; Jim thinks I should study to become a ham operator, too. Just what I need: another hobby! I can't keep up with all the ones I already have.